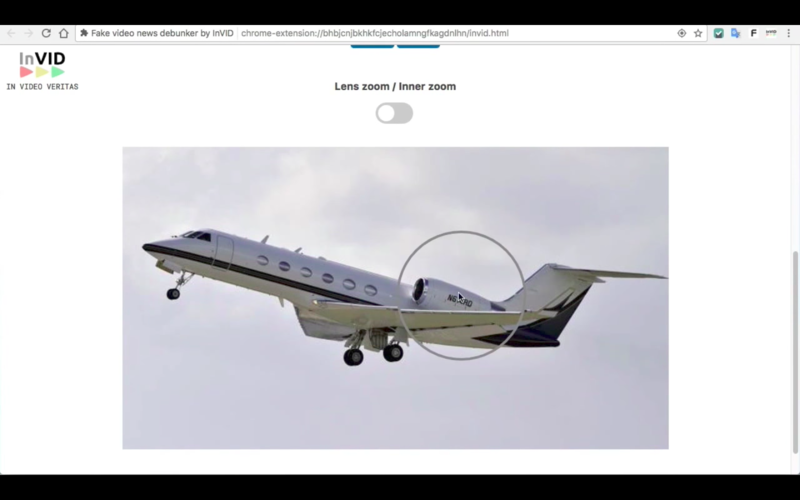 One of the features of InVID's video verification tool is a magnifier that lets users zoom in to better inspect an image. Since the panic over fake news erupted after the U.S. election and spread into Europe, a number of fact-checking and content verification tools went into development. But there are still few tools dedicated to video verification. InVID, a three-year collaborative project based in Europe, aims to change that. The goal of InVID, which launched in January 2016, is to help journalists discover and verify newsworthy content on social networks, says Innovation Manager Denis Teyssou, who is also the editorial manager for Agence France-Presse’s Medialab. The team’s first project is a video verification browser plugin for Chrome and Firefox. The plugin is designed to be like “a Swiss Army knife,” in the way that it combines several tools in a single unit, he said. It’s being funded through Horizon 2020, a European program that provides funding to innovative projects. Several groups are involved: the Centre for Research and Technology Hellas, Modul Technology, the Universitat de Lleida, Exo Makina, WebLyzard Technology, Condat AG, APA-IT Informations Technologie, Agence France-Presse and Deutsche Welle. How did the idea for InVID’s verification tool come about? InVID had been involved in the First Draft News CrossCheck initiative, a collaborative project that brought together newsrooms in Europe to fight fake news ahead of the French presidential election. The plugin was born of that effort; Teyssou said that the InVID team wants to share the tool with the larger journalistic community in order to get feedback and improve it, especially now that the issue of fake news has increased, especially in the United States and Europe. What are the problems the project aims to solve? “We applied design thinking methodology to understand the journalistic verification workflows and processes and to ideate new solutions or ways to improve existing solutions,” Teyssou said. The plugin is designed to solve several workflow challenges by combining several existing tools, such as Twitter search functionality. It also aims to automate cumbersome tasks, such as taking screenshots and uploading them to a reverse image search engine. The InVID tool automatically retrieves thumbnails or keyframes from social media platforms. And it provides the available contextual information about a video all in one place. How does the verification tool work? The plugin allows the user to paste a URL to a YouTube or Facebook video. The tool then provides an analysis of the video’s origins, including when it was uploaded, the locations featured and thumbnails retrieved from different search engines. Keyframes will extract keyframes from the video so that a reverse image search can be done. Thumbnails finds thumbnails from YouTube and reverse image searches for them through Google and the Russian search engine Yandex. Twitter Advanced Search is updated to the minute and can help journalists verify events in a breaking news situation. Magnifier lets the user zoom in on an image to more easily inspect it, and is designed for users who don’t have photo software like Photoshop. Metadata is a metadata reader that uses open source libraries. Forensic offers filters to help discover any alterations that may have been made to an image. What were some of the challenges in developing the tool? There were three main challenges the InVID team faced, Teyssou said. First, fake news spreads quickly from platform to platform. And while some platforms have open APIs and allow advanced search, others are closed, which makes verification more difficult. Finally, most social networks erase the original metadata of multimedia content. What are the future plans for InVID’s plugin? The plugin is distributed as open source, and it’s available for Google Chrome and Firefox browsers so far, and the team plans to maintain it at least until the end of 2018, Teyssou said. “So far we got some nice and encouraging comments from verification experts on social networks, and we hope to get valuable feedback from the community to develop more tools and improve the existing ones,” he said. The team is also developing two other projects: a platform which helps users discover newsworthy videos, and a web application that helps verify those videos.